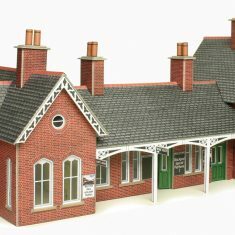 This is a re-release of our popular 00 red brick station. Based on standard designs by Cheshire Lines Railway. A sturdier design, the kit now includes a larger opposite platform shelter. Click on image to see full picture. Use with P0216 Red Brick Platform.